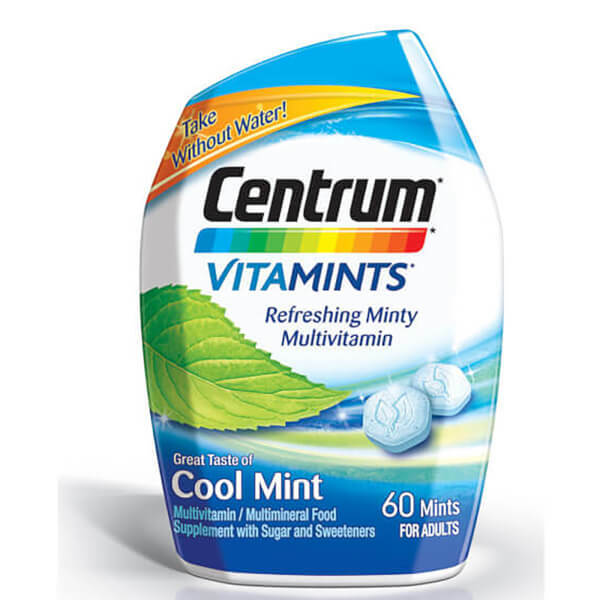 Boost your vitality with the Centrum VitaMint Cool Mint Tablets; an advanced multivitamin that you can enjoy like a mint with the added benefits of essential nutrients. Isomalt, Maltodextrin, Sodium Ascorbate (Vit. C), dl-Alpha Tocopheryl Acetate (Vit. E). Contains <2% of: Acacia, Acesulfame Potassium, Beta-Carotene, BHT (to preserve freshness), Biotin, Blue 2 Lake, Calcium Pantothenate, Cholecalciferol (Vit. D3), Chromic Chloride, Citric Acid Esters of Mono- and Di-Glycerides, Cyanocobalamin (Vit. B12), Dibasic Calcium Phosphate, Folic Acid, Gelatin, Magnesium Stearate, Manganese Sulfate, Microcrystalline Cellulose, Mono- and Di-Glycerides, Natural and Artificial Flavors, Niacinamide, Phytonadione (Vit. K), Potassium Iodide, Pyridoxine Hydrochloride (Vit. B6), Sodium Molybdate, Sodium Selenate, Sucralose, Thiamine Mononitrate (Vit. B1), Tocopherols (to preserve freshness), Vitamin A Acetate, Zinc Oxide.